Siding is finally (almost) done. I’ve gotten into a bad habit on this blog of waiting until major stages are complete or major decisions are made before posting. It makes for good, succinct reading, without a ton of incomplete updates every other day, but the downside is that I lose the ability to take advice from readers before strings are pulled. For that reason, I’m going to try and post more frequently until the project is complete, starting now. The big news of the week is that siding is finally nearing completion. Given how many different materials I’m using and how much detail is involved, it’s taken about a month and a half to side the house so far, and there’s still probably a week or two left. Brett Deerly and the crew over at Deerly Construction have done a great job so far, often working on weekends, and pounding away in the driving Seattle rain. Getting rainscreen siding to align perfectly is a difficult task and I’m really happy with the results so far. 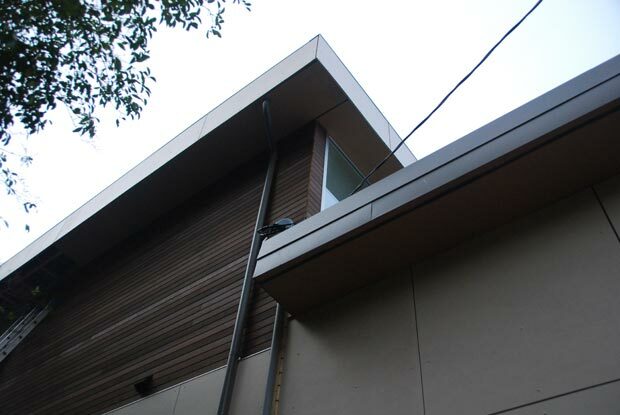 The ground level of the house is clad in rainscreen paneling made by Cembonit. Although rainscreens have been used in Norwegian architecture for centuries, they only made it to the United States during the 1950s. Within the last several years, they’ve gained popularity in American modern home design. The concept behind a rainscreen is that you have a waterproof, Gore-Tex-like fabric wrapping your framing and then solid panels installed over the Gore-Tex. The panels catch most of the rain carrying it down to the ground while the fabric catches and repels the rest. The panels have quarter-inch gaps between them so they effectively let the whole assembly “breathe”. The idea is that you concentrate more on letting water get out of the structure as opposed to keeping it from getting in. Sealed materials like stucco try to do the opposite: keep water out at all costs. The problem with this strategy, however, in a wet environment like Seattle, is that if it fails (which it often does), it fails badly. Water gets trapped inside the stucco and you have major problems. When you see houses or condos getting their siding replaced within ten years of going up, this is usually what has happened. Truth be told, I actually prefer the look of well done stucco or wood siding, but the practical benefits and low maintenance of the rainscreen system made it desirable for this project. 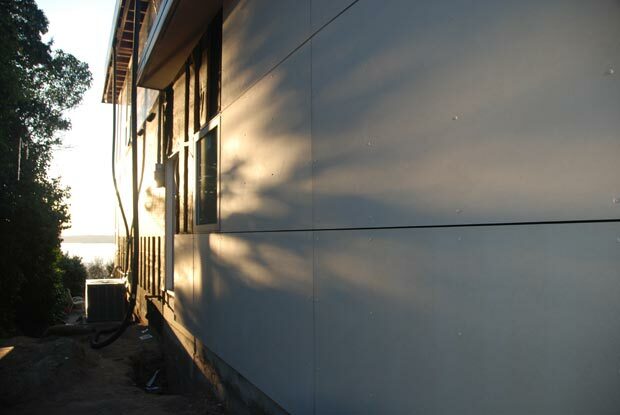 We chose Cembonit because unlike the more commonly used HardiePanel siding, it is pure cement board. There are no cellulose fibers, and thus it is extremely rigid and durable. It also comes pre-dyed in several colors, so it doesn’t require any painting (although you can paint it if you’d like). It turns out Cembonit is not being shipped to North America anymore, but we found a place in Kentucky that had a bunch of it and got a great deal at $4 per square foot. The siding is more or less the color of light concrete… a little warmer maybe. We ended up going with locally-grown red cedar, stained dark brown, for the upper massing of the house. Although I love the look of wood, I hate the maintenance of it, so we limited our use of wood siding to areas mostly sheltered by eaves. The wood will clearly see a bit of sun and rain, but not as much as other, differently-clad areas of the house. We went with a semi-transparent stain in order to let some of the woodgrain show through but still maintain a reasonable amount of protection against the elements. One thing I’m not super excited about right now is the corner detail of the cedar siding. One side is just kind of butted up against the other side at the corner, exposing the edge grain, which is currently unstained. When the edge gets stained, it will certainly look better, but it seems like mitering the corners would have produced a slightly cleaner look. We’ll see how that one turns out though… could be perfectly fine once it’s done. 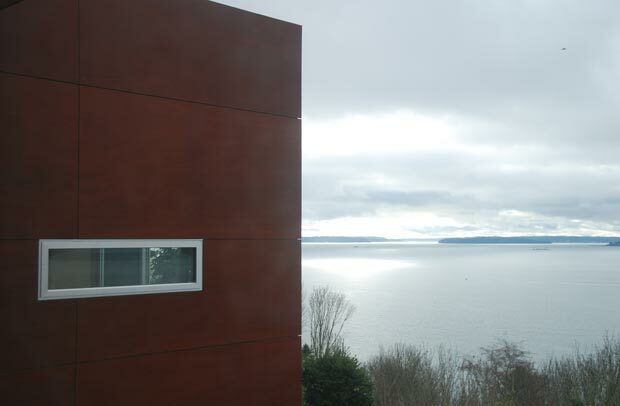 The giant wall of windows facing Puget Sound will be clad in anodized aluminum to match the window frames. This should produce a pretty dramatic, but hopefully not overly bright effect. Not that this is important to me, but I imagine this will make the house pretty unmistakable from the water and even possibly from Bainbridge Island. The box is the signature design element of the entire house. It’s the sort of thing you’d more often see in the design of a museum than a residence. 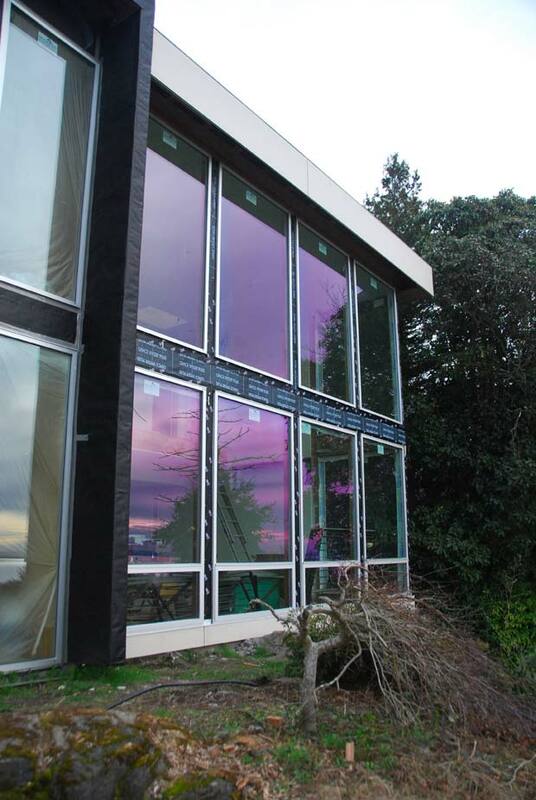 For this reason, it was crucial we clad it in a material that was attractive and wouldn’t weather with the elements. Build initially pushed hard for brazilian ipe, but I was too afraid of what it would look like when it inevitably silvered. Part of the challenge of the box, is that some of it is inside and some of it is outside. Some faces east, some faces west, some faces north, and some faces south. Its exposure to the elements is very uneven and so it was important to choose a material that would stay as pristine as possible no matter what exposure it received. I also didn’t want any more cold, industrial material like metal because I’m trying to keep the house warm looking (often a challenge in modern home design). In other words, it’s a mostly synthetic panel with a real wood veneer that is maintenance-free and extremely resistant to water and sun. Real wood without the trouble of real wood. I’d seen Prodema on a couple of other houses in Seattle as well as some commercial applications and it always looks great. I’ve heard some stories about Prodema failing, but the warranty should take care of that if it happens. Another challenge we had when deciding how to wrap the box was how it would carry through to the inside of the house. In the end, we decided to wrap it a couple of feet into the interior, on all sides. Carrying it along the entire interior of the box would have looked dramatic, but it was too risky and too ripe for looking dated more quickly. And finally, I would be remiss if I didn’t mention that there is a similar material called Ecoclad that is made less than an hour away in Tacoma that we could have used instead of the Spanish-made Prodema. Unfortunately, however, the company refused to send us any samples, and I’ve heard from others that they are very difficult to deal with. Such a huge wasted opportunity to use a local material. Thanks for making me ship over a $14 per square foot product from Spain instead. It’s going to take me awhile to put together the timelapse of the siding but I’ll post it as soon as I have it. For now, there are photos in the gallery.